Sarah Louise Vaughan was born in 1924 in Newark, New Jersey. Both of her parents were amateur musicians and they provided their daughter piano lessons as a child as well as a solid background in vocals, as a member of her mother’s church choir. By 1943, 19-year- old Sarah was ready to make music her career. Despite her natural shyness and lack of stage polish, she won an amateur contest at Harlem’s renowned Apollo Theatre. That performance led to Sarah’s “discovery” by Billy Eckstine who helped her become a vocalist and musician with the Earl Hines Band. Vaughn left Hines’s band to join Eckstine’s new orchestra and make her recording debut. By 1946 Sarah Vaughn was a solo artist who was rapidly becoming well known as one of the first jazz artists to use “bop” phrasing in her singing. During the 1950s, she adopted a new style which allowed her to record numerous “pop” tunes that were commercially successful. While her embrace of pop music scandalized jazz purists, it greatly widened Sarah’s fan base and demonstrated her business acumen, which many of her colleagues eventually grew to admire. While Vaughan never gained the public renown of fellow performers such as Ella Fitzgerald or Billie Holliday, she is generally considered to have one of the greatest voices in the business and is credited with being a major force behind the popularity of “bop” music. 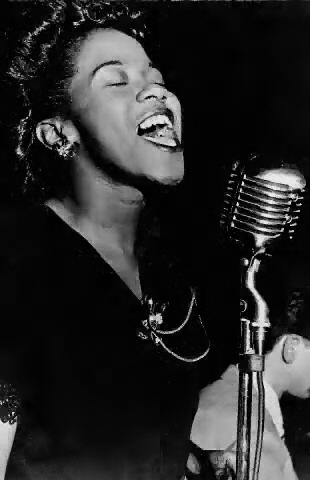 Some of her biggest hits include such classics as “Misty,” “My Funny Valentine,” and “Tenderly.” Her determination and ability to fit in (despite her natural shyness) with the mostly male dominated world of jazz music earned her the moniker “Sassy.” Her flawless voice earned her the title “the Divine One;” but it was the breadth of her impact on the world of jazz and music in general that earned her multiple Grammy’s, including the 1989 Lifetime Achievement Award, as well as a place in the Jazz Hall of Fame. Sarah Vaughan passed away in New York City at 66. Leslie Gourse, Sassy: The Life of Sarah Vaughan (New York: Da Capo Press, 1993); Joyce West Stevens, Smart and Sassy: The Strengths of Inner City Black Girls (New York: Oxford University Press, 2002); PBS, http://www.pbs.org/wnet/americanmasters/database/vaughan_s.html; Rutgers Women’s History Project, http://www.scc.rutgers.edu/njwomenshistory/Period_5/vaughan.htm; Soulwalking, http://www.soulwalking.co.uk/Sarah%20Vaughn.html.